Republican Congressman Steve King says he’s ready to mount a vigorous defense of the president in the U.S. House Judiciary Committee next year. King predicts “a good number” of Democrats will try to impeach the president once Democrats take the majority in the House in January. 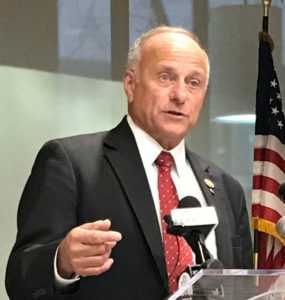 Once he returns to Washington, King also plans to confront Ohio Congressman Steve Stivers, the head of the National Republican Congressional Committee. On October 30th, Stivers took to Twitter to say the country “must stand up against white supremacy and hate” and Stivers “strongly” condemned King. King won his eight previous races for congress by an average margin of 23 percent. His victory margin in 2018 was about two percent. J.D. Scholten is the Democrat who came within 10,500 votes of defeating King in district that has a 70,000 Republican voter registration edge. King has accused his critics of trying to “Kavanaugh-ize” him in the closing weeks of the election. Scholten has not ruled out another run against King in 2020. Long-time Iowa Congressman Berkley Bedell and Senator Tom Harkin — who was first elected to the House — were both elected in their second try for a House seat.